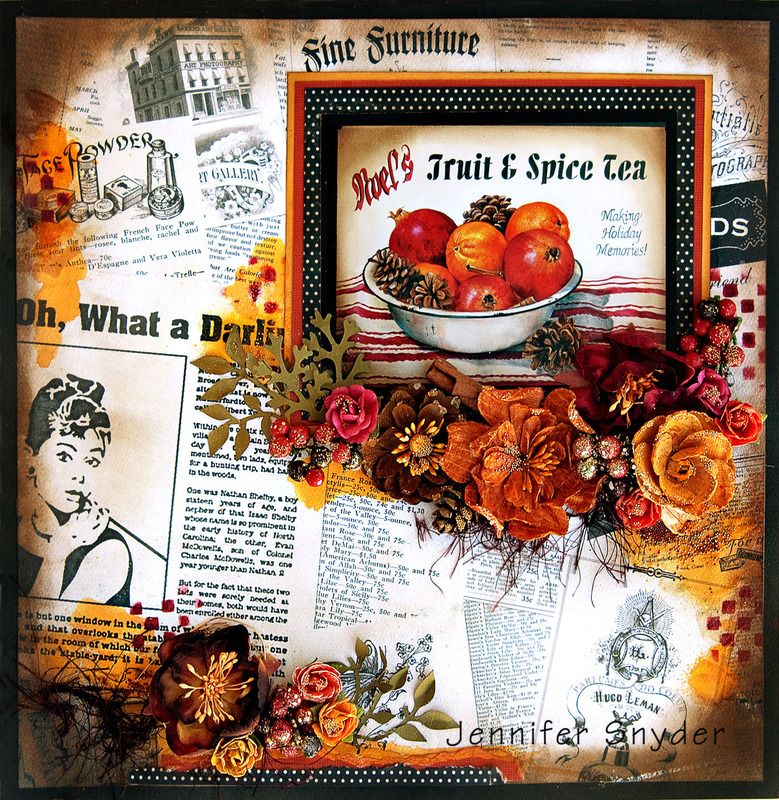 We are so excited to bring you our March 2014 Kit of the Month. This month's features Authentique's Classique Elegance collection. This particular sheet of the background paper reminded me a little of a tablecloth from an old diner. Then I remembered I had a great postcard to use as the focal point. 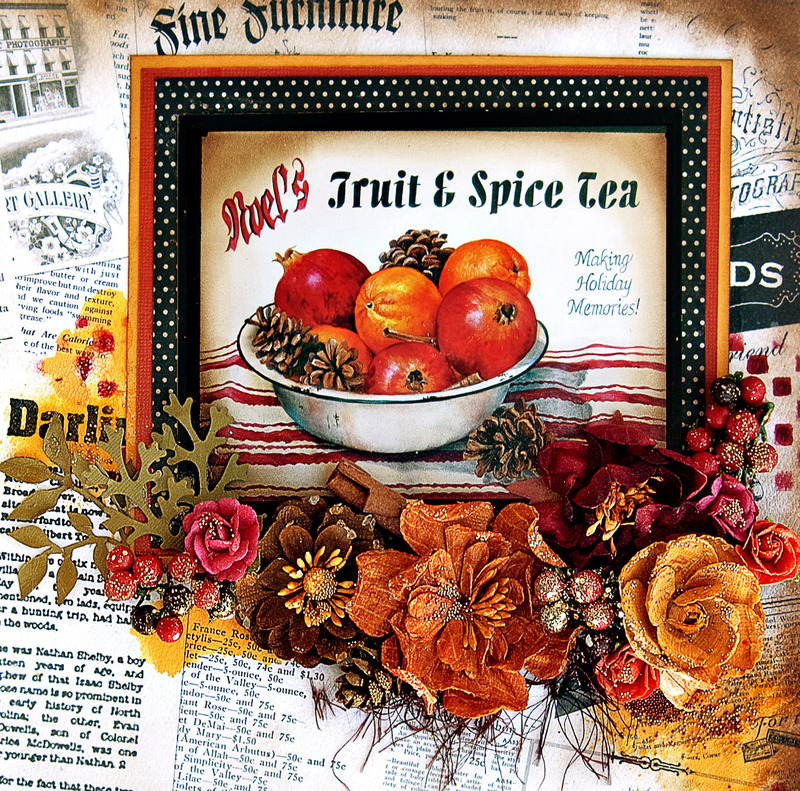 The inspiration for this piece was from a card by artist, Debbie Cotton from Simply Cotton. I met Debbie in California at the 2014 CHA - Craft And Hobby Assoc Trade show. What a talent she has. She invited me to her Gallery section where I admired all her pieces. 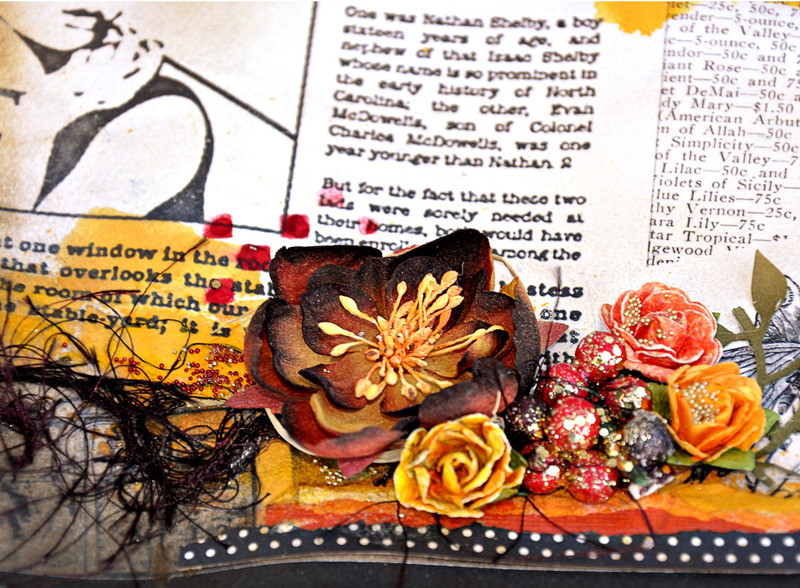 This is a postcard from her collection that is so vibrant and warm. She did give permission for me to use on my pages as well. Thanks Debbie! I am in love with your work. Please check her website out here. 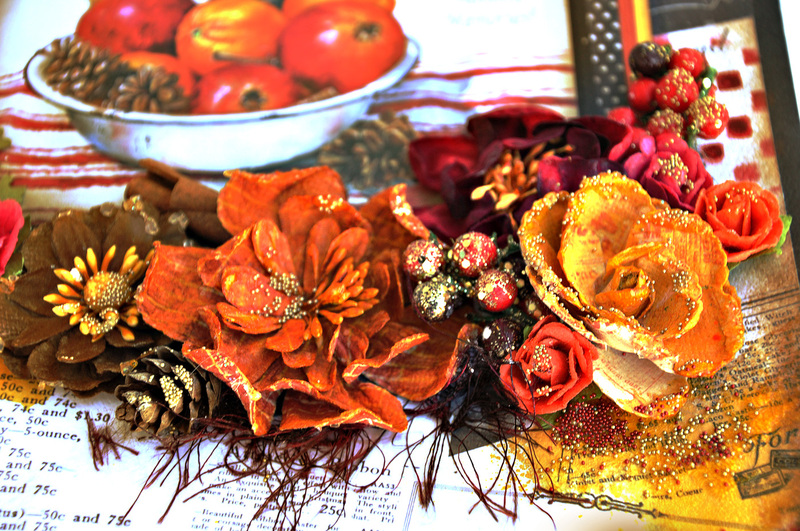 My floral cluster is an assortment of Prima flowers, some cinnamon sticks and pine cones to compliment the items in the fruit bowl. I also added a topping of micro beads to the florals and embellishments. The Flying Unicorns March kit is filled with creative goodies that will excite. Grab one before it's gone. The monthly kits are only available on a first come first served basis. CLICK HERE - to get yours now. Last month they sold out in a day. No monthly kit obligations required. Flying Unicorns March 2014 Kit of the Month. I participate in affiliate programs. This means I may be compensated in exchange for use of certain sponsored products used on my projects. This blog also uses referral links for which I may earn compensation. Read my Disclaimer for more information. All content on this blog has been written and edited by me. All projects featured are my own original creations unless otherwise stated. I purchase much of my own supplies, however I may be compensated with product if I participate in a Design Team capacity. I may also be compensated by a sponsor in exchange for use/feature placement of their product within a blog post. I will always provide an honest opinion however content of this blog may be influenced by each sponsor. I do use referral links to companies which my compensate me. I am Jennifer Snyder and I live in New York with my family. 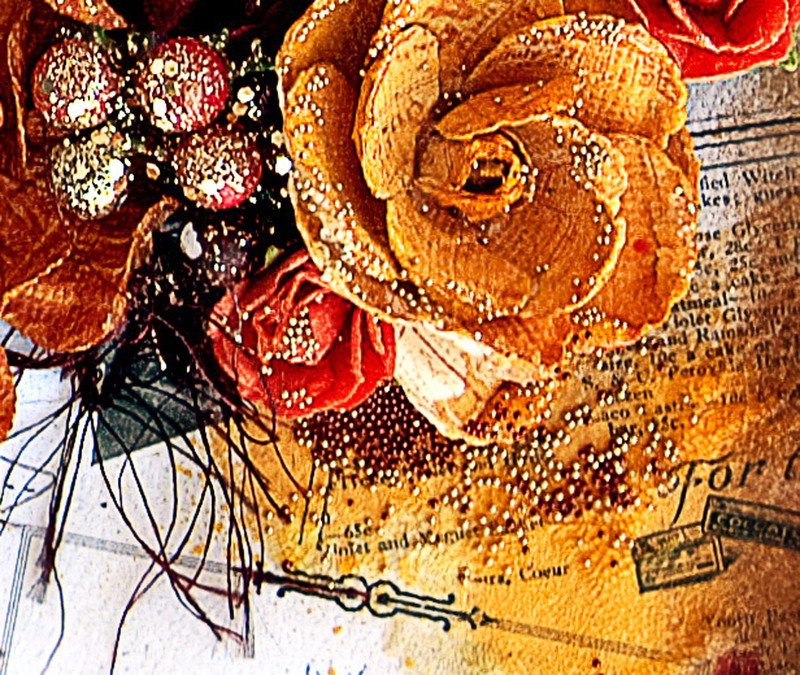 I do work outside the home and find papercrafting to be a hobby that can keep the mind active, youthful and refreshed. What's in My ETSY Shop? Copyright 2012 Jennifer Snyder. Simple theme. Powered by Blogger.